President Trump has just unveiled the outline of his tax reform proposal. Tax reform done right can give our economy a needed shot in the arm. The big question is, of course, what is the right way to do it? Promote Economic Growth and Dedicate the Gains to Deficit Reduction. 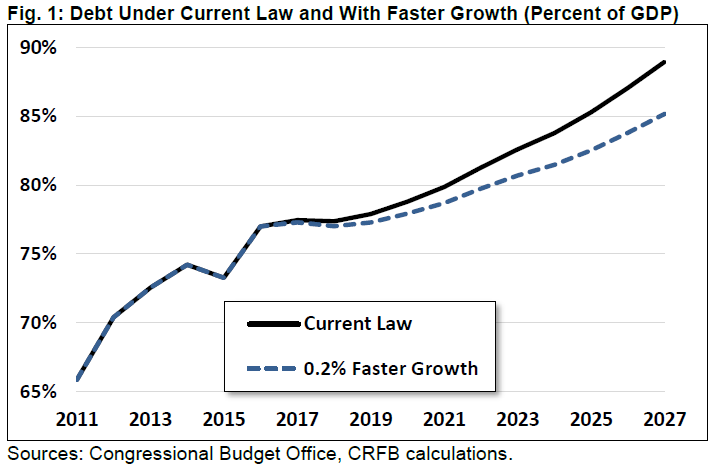 The Joint Committee on Taxation and the Treasury Department have estimated that comprehensive tax reform can increase the growth rate of GDP over the next decade by .05 to .25% per year. For example, a .2% increase would reduce our debt by $550 billion over ten years (see chart). This does not fix our fiscal problems but it helps. Maintain or Reduce Current Deficits. Make sure that any tax rate cuts are offset by revenue increases (i.e. shrinking tax deductions) so that the annual deficit is not increased. Ultimately, our fiscal challenges are unlikely to be solved without reducing spending, reforming entitlements and increasing revenue. Set Permanent Tax Policy. The reconciliation process in the Senate, whereby a simple majority can approve legislation, disallows any increase in the debt beyond ten years. In other words, permanent tax reform will require a sixty vote majority to override a filibuster. This is the only way to achieve sound policy. Avoid Unjustified Timing Shifts and Other Gimmicks. A timing shift is a gimmick if it doesn’t make economic sense. For example, gradually reducing tax rates, rather than cutting them immediately, would only delay revenue losses by shifting them to the future, and is therefore a gimmick. Rely on Reasonable Economic Assumptions. A good example of a faulty economic assumption is to arbitrarily assume that a tax rate reduction will create 3% annual GDP growth and therefore pay for itself over a sufficiently long time period. Such a proposal was made by the economist Stephen Moore in yesterday’s Wall Street Journal. Conclusion. Slow economic growth and massive debt are our country’s two biggest problems. Tax reform done right will speed up growth without worsening the debt. I will be paying close attention to the forthcoming debate on this issue. This entry was posted in Committee for a Responsible Federal Budget, debt, deficit, Donald Trump, economic growth, pro-growth economic policy, pro-growth tax reform, tax rate cut, tax reform, tax revenue, Wall Street Journal and tagged debt, deficit, Deficit spending, Donald Trump, economic growth, jack heidel, tax reform, Wall Street Journal by jackheidel. Bookmark the permalink. Reducing or eliminating estate tax is a terrible idea. It only leads to greater inequality over generations. The Estate Tax should not be eliminated or even lowered until we have achieved a balanced budget.